A couple of things to remember before today’s Quarter Final. England haven’t beaten either of their last two opponents in 90 minutes. Yes, the 1-0 defeat to Belgium nine days ago was basically a reserve game where losing wasn’t the worst outcome, but after having watched the Red Devils in action against Brazil yesterday it’s hard not to argue that even if that game had been between two full strength sides, England would have needed to have pulled all the stops out to beat our near neighbours. Colombia didn’t have James Rodriguez available but England should have won that game in 90 minutes. If Colombia had played as well as they could have done – and I’ve got no idea why they didn’t apart from the last five minutes of the second half – then England would have been in trouble. The Cafeteros lost because they deserved to and I’m sure that had Bobby Moore still been with us he’d have felt pleased that the swines who framed him for stealing that necklace all those years ago were knocked out in a penalty shoot out that we finally won. Don’t get me wrong, this is a refreshing change from the last few tournaments. But I don’t think I’m alone when writing that I am worried about the level of expectation amongst casual fans (and especially how they’ll react if/when England are eliminated) but I’ve also had to field several ridiculous enquiries about a dating app for England fans and a couple of less than stellar attempts to emulate ‘World Cup Willy’, ‘Back Home’ and ‘Three Lions’. If football does actually come home in just over seven days’ time, expect the camp followers and the baggage train to be very much in evidence. 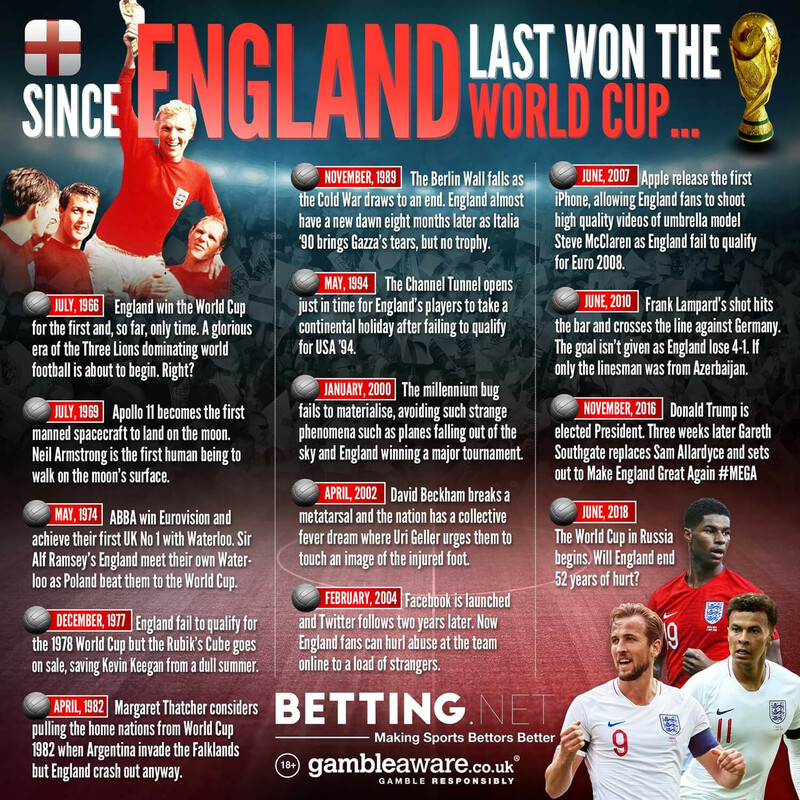 With just over two hours to go until England make their debut in the 2018 FIFA World Cup, here’s a humorous take on some of the historic events over the last half century! As some of you already know, we lost all the content from March 2013 but in some respects that was a blessing in disguise – it means we don’t have anything to refer to from the disastrous outings in the last two tournaments. A bit like the England team itself in that case. There are only five players in this squad that went to Brazil four years ago and so this is practically a brand new side – the veteran is Ashley Young, who is five months older than Gary Cahill despite having won 24 fewer caps – and the only teenager in the side is Trent Alexander-Arnold. This looks like a squad for the future, but time will tell. 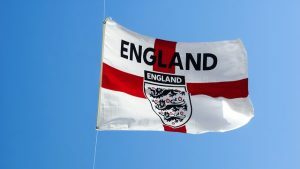 That being said, England are currently 16/1 to win the whole thing – about right considering it’s been 12 years since we got to the quarter finals and 28 since the semi finals – but that’s a bigger price than both our Group G rivals Belgium and arguably the least impressive Argentinian side since 2002. With all due respect to both Panama and Tunisia, for once I agree with both the bookies and the pundits: the group is been us and Belgium, but as we face the Red Devils last it may come down to who can score the most goals against Panama. The Belgians get first crack at that next Monday (BBC1, 4:00pm) before we take on Tunisia (BBC1, 7:00pm) so at least we’ll have an idea of what we need to achieve in our second game (against Panama, Sunday 24th June, BBC1, 1:00pm). Goals are where the potential issues are: only Harry Kane and Danny Welbeck have scored more than ten goals in their international careers and – unlike previous tournaments – they aren’t going to get much help in that respect from the midfield. In some respects Kane is comparable to Romelu Lukaku – he’s two months younger and they have similar strike rates in international games – but we don’t have anyone like Kevin DeBruyne or even Marouane Fellaini behind them. Assuming we do get out of Group G – and a draw with Belgium should probably be enough – our next opponents will be one of the qualifiers from Group H. That section has been widely predicted as the most open of all the groups this summer and I’d agree with that: although Colombia reached the second round in Italia 90, it’s been 36 years since Poland qualified from the group stage in a ‘European’ World Cup and neither Japan nor Senegal have ever done that. We could be in trouble if it’s Poland: they’ve been rated higher in than us in the ever reliable (!) FIFA rankings since February 2017 and although they’ve not beaten us for 45 years, records like that are made to be broken. After that it’s anyone’s guess. As for predictions, I’d say that another unsuccessful trip to the quarter finals is probably on the cards but as long as the team performs at a better level than 2014 – not an unrealistic expectation – then the fans can be happy. A little bit of luck and we might even lose narrowly to the Germans yet again. From a wider perspective, in the same way as winning the Champions League and the Premier League seem to have become competitions that only elite teams can win, I’m not expecting a ‘new’ name on the World Cup this summer. However, it’s worth pointing out that no country has won consecutive titles since Brazil in 1962 and with some serious questions about the morale of the Germany squad following an ill advised photo session that featured Mezut Ozil and Ilkay Gundogan with the Turkish PM, the Germans might not retain their title. Spain – who sacked their manager yesterday – have a dreadful record in European based tournaments and despite been written off, Argentina actually have a slightly better record than Brazil do when playing in European World Cups. Like most of us, I’ll probably have a much better idea of who might win the whole thing in a couple of weeks time but the two teams I’ll be following are Brazil and France: the former because they have a point to prove after their disastrous semi final four years ago and the latter because – on paper at least – they have the talent to compete with the Latin Americans. The question with the French is whether Didier Deschamps can utilise that talent effectively. I know FIFA rankings can be a bit odd, but Egypt overtook Russia in June 2016 and even though it was against the Soviet Union, the Egyptians won their only previous meeting back in June 1991. I also think there’s the possibility of a surprise result in the game between Argentina and Iceland (Saturday, 7pm ITV) but that may be along the lines of Argentina not winning. Four hours or so after England v Panama finishes so don’t say I didn’t warn you. The assumption is that France and Denmark will qualify from Group B, but if anything upsets that plan then both of these teams might need to win to qualify for the next round: this pair are suspect defensively so there might be a few goals in a game that features two very colourful kits. Brazil and Germany finish their group games on the same day. Although both of them should have qualified for the The Round of Sixteen, Serbia might need a point or three to join them. If South Korea v Germany starts getting out of hand, turn over to Mexico v Sweden on BBC2 because that’s probably going to be the game that settles the runners up in Group F.
Next scheduled post: a preview of England v Tunisia, which will be up at some point on Monday! They aren’t amongst the favourites for the World Cup, but Gareth Southgate’s side could cause an upset this summer. After all, we have one of the best strikers in the world and that’s often – but not always – an advantage. However, Southgate will have selection issues as on paper as there are many players who could have an impact. Since becoming the England national team manager back in 2016, Southgate has always preferred three defenders at the back. With Manchester City’s John Stones and Leicester’s Harry Maguire looking assured of their places in the World Cup, Kyle Walker has been shuttled between right back and central defence in some friendlies. We’ve seen in previous tournaments – notably 1990 – that some flexibility is desirable when picking a team. Southgate will be expected to field creative players like Dele Alli even though a 3-4-3 would not favour the Tottenham midfielder. Alli is not a flying wing player like Raheem Sterling or Alex Oxlade-Chamberlain but he can cause problems for defences by dropping in the hole behind Kane and creating chances. Jones, who will all hoping to earn a flight to Russia in a few weeks time. Flexibility could be Southgate’s secret weapon in the 2018 tournament, but a lot may depend on the individual performances of Kane and Alli on the biggest stage in the football world. Both the players and the fans will be hoping for a better performance than in Brazil four years ago: on paper, the players who could feature in Russia this summer should be able to get out of Group G but that’s what we assumed last time round – and look what happened then! I’ve got to say that 8-0 was what I was hoping for on Friday, but the best part about that win was the dramatic improvement in the goal difference. Tomorrow’s game is a much sterner test – in his first article for the site, guest contributor Owen Barnes tells us what to expect. The Montenegrins now stand two points clear of England – however the dismissal of crucial midfielder Nikola Pekovi may prove costly to their chances of winning tomorrow’s game. Montenegro started the game against Moldova leading group H, previously beating San Marino 3-0 in a match they dominated. With England trampling over the San Marino side 8-0 we can imagine many English supporters rubbing their hands at tomorrow’s fixture. However, with Stefan Joveti and Vuini leading the front line for the national side England cannot afford to be complacent. The controversial issue with Rio Ferdinand’s absence in previous games may give Montenegro a chance to pounce. Ferdinand has been brilliant for Manchester United in the past month and they may feel his absence against the two technically-gifted strikers. However Hodgson seems confident that the pairing Phil Jagielka and Tim Cahill can deny the Serie A strikers of causing any upsets, despite Moldova only having two shots with none on target. England will start the game as favourites, with their star man Wayne Rooney scoring six goals in his past four games for the lions. He has shown consistency, which could be the lack of pressure from his club allowing him to focus on his international career, but he will need to be in top form to solve any sticky situations he faces. The potential attacking force of Rooney, Alex Oxlade-Chamberlain and Ashley Young can cause serious problems for the oppositionâ€™s back line. Link up play from team mates Young and Rooney as well as the pace of Oxlade-Chamberlain will produce goals, assists and flair as seen in the San Marino game. As the Moldovans came close to scoring within two minutes of the kick off last Friday, the English front three are certainly with the ability of causing havoc for Montenegro. Moldova dealt with the efforts of Joveti and Vuini very nicely, but the Montenegrin strikers will also continuously test England’s defence. Having netted 23 goals between them in Italy this season, their total of five shots on target tested the Moldovan keeper Serghei Pascenco, who did well to keep the game at deadlock until the 78th minute, where Vuini proved his finishing with a scrappy volley inside the penalty box. One possible area for English concern is when Joveti is standing over the ball in set pieces: when San Marino were in the English half for a corner there was some doubt how England would cope. Thankfully Kyle Walker was able to rescue the lions by dribbling a good 60 yards down the right hand side to put San Marino back under pressure. With England having an advantage in goal difference, a clean sheet at the Podgorica Stadium would be a real achievement. Hodgson may look at James Milner for stability, which could mean allowing Tom Cleverley to rest. The absence of Jack Wilshere could be costly for the English midfield unless all midfielders put in a good shift. A big test awaits for England and they must maintain possession and keep the ball away from Montenegro’s attacking force. Betting odds (SkyBets): England 4/5, Montenegro 7/2. 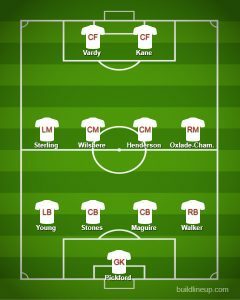 England Possible Line-up (4-4-2) Joe Hart, Kyle Walker, Phil Jagielka, Michael Carrick, Leighton Baines; Alex Oxlade-Chamberlain, James Milner, Frank Lampard, Ashley Young; Wayne Rooney, Jermain Defoe. Congratulations to Ashley Cole, who will win his 100th England cap this evening when he plays against Brazil in a friendly tonight. Rather than take the obvious route, I thought we’d celebrate the group of players Cole joins this evening. The most astonishing thing about the Centurions is that it wasn’t until Billy Wright won his 42nd cap in May 1952 that he broke the record for England’s most capped player – Bob Crompton of Blackburn Rovers had held it for almost forty years. Or to put it another way, Crompton’s record was set before the start of the First World War and wasn’t broken until seven years after the Second World War finished. Another surprise was that I’d assumed that it’d taken Billy Wright longer to win a century of caps because England had played fewer games in his era. Wrong. Billy Wright and David Beckham’s England careers both lasted fourteen years, whilst Bobby Moore won his caps in just twelve. At the other end of the scale, Peter Shilton earned his 125 caps in 19 years – with the vast majority of them coming after he took over from Ray Clemence in 1982. So here’s a timeline of who, how and when the Centurions reached their milestones. 28th September 1946:Â Billy Wright makes his full England debut in a 7-2 win over Northern Ireland at Windsor Park in Belfast. Wright’s first international appearance was at the start of the year in an unofficial ‘victory international’ against Belgium to celebrate the end of the Second World War. 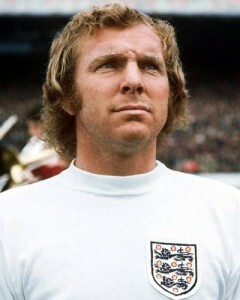 Bobby Charlton is eight years old, Bobby Moore is five. Peter Shilton is seven years old, Bobby Moore has just celebrated his 17th birthday and is a few months away from making his West Ham debut against Bobby Charlton’s Manchester United. Charlton won’t be playing though. He’s recovering from injuries sustained in the Munich Air disaster, which happened 55 years ago today. 28th May 1959: Billy Wright wins his final cap in an 8-1 win over the USA. 11th June 1970: Bobby Charlton makes his 105th and last appearance for England, who are beaten 3-2 by West Germany in the quarter finals of the World Cup in Mexico. ‘Back Home’ has just been deposed at Number One by this song and England won’t qualify for another World Cup Finals tournament for 12 years…dark days indeed. 25th November 1970: Peter Shilton makes his England debut in a friendly against East Germany which England win 3-1. Bobby More wins his 85th cap. 14th February 1973: Bobby Moore wins his 100th cap in a 5-0 win over Scotland. Exactly nine months later, Moore makes his last appearance in an England shirt in a 1-0 defeat to Italy. Earlier that day, Captain Mark Phillips had married Princess Anne. 15th June 1988: Peter Shilton wins his 100th cap in the 3-1 defeat by the Netherlands in the European Championship finals. Just over two years later, Shilton makes his last appearance between the sticks in the 3rd place playoff defeat to Italy in the 1990 World Cup: David Beckham is 15 years old and has already signed schoolboy forms for Manchester United. Ashley Cole is nine. 24th February 1993: Bobby Moore dies aged 51. 3rd September 1994: Billy Wright dies in London aged 70. 1st September 1996: England beat Moldova 3-0 in a World Cup qualifier in Chisinau and David Beckham makes his England debut. Incredibly, the Spice Girls are number one with ‘Wannabe’. 28th February 2001: England beat Spain 3-0 in a friendly at Villa Park and Ashley Cole wins his first cap. David Beckham is making his 38th appearance but the game is overshadowed by the Selby rail crash. 26th March 2008: David Beckham wins his 100th cap in a 1-0 defeat by France. Eighteen months later Beckham makes his final appearance in an England shirt in a 3-0 win over Belarus in a World Cup qualifier. Yes, It Was A Fantastic Goal. But That’s Not The Point. First of all, I’m not really that interested in friendlies. I didn’t watch the game last night: my mother in law did and she sent me a text saying ‘what a goal’ because she was watching it. I turned over, thinking Sweden had equalised (I imagined the score was still 2-1) but I had to watch the end of the game to see Zlatan Ibrahimovic score his wonder goal…and surely I’m not the only person who thought that Joe Hart was to blame for it. The real story last night happened in Montenegro. Two goals from Andrija Delibasic and one from Elsad Zverotic gave the hosts a 3-0 win over San Marino and sent Montengro back to the top of World Cup Qualifying Group H: having played the same amount of games, the Montenegrins have two more points and exactly the same goal difference. We play them in Podgorica at the end of March 2013 in a game that will go a long to way to determining who wins the group and who has to face the playoffs – and at the moment, that could mean a potential tie with France, Croatia or Sweden. So although it was good to see three young debutants in Stockholm last night – and not forgetting that Steven Gerrard reached a genuine milestone, for which he deserves congratulations – the result is a little worrying. England have only kept four clean sheets in the last ten games and only one of those teams (Italy) is what you’d describe as a world footballing power. As much as I don’t want to sound like a grumpy git, I think the remaining World Cup qualifiers may be not as straightforward as we’d all like to think. We’ll see: the next game is against Brazil in February but if Neymar or Hulk (another player who ‘doesn’t do well against English teams’) are on form then it might not be pleasant viewing. Did Anyone Know It Rained In Warsaw In October? Ridiculous. The game has been rearranged for tomorrow afternoon at 4:00pm GMT.